Dried cherries don't top my list of favorite fruit for backpacking, but they can be a welcome addition to granola and trail mix. If you have a tree or stumble upon a bonanza deal at the fruit stand, it's worthwhile to run a few trays through the dehydrator. Here's how I do it. Depending on the tartness of the fruit and your own tastes, dried cherries may benefit from syrup blanching to make them more palatable. In the front yards of the Pacific Northwest there seems to be an abundance of mouth-puckering "pie cherries," that usually require heaps of sugar to make them worthy candidates for the dessert menu. When drying these cherries, I prefer syrup blanching, which practically renders them to candied fruit. For the black, sweet commercial cherries popular in delis and grocery stores, syrup blanching before drying is elective. While pretreatment isn't necessary, drying cherries whole will turn out better if they are checked in boiling water for thirty seconds, followed by a plunge into cold water to crack the thick skins. This allows the berries to dehydrate quicker and more evenly, and will also allow the to reconstitute faster. 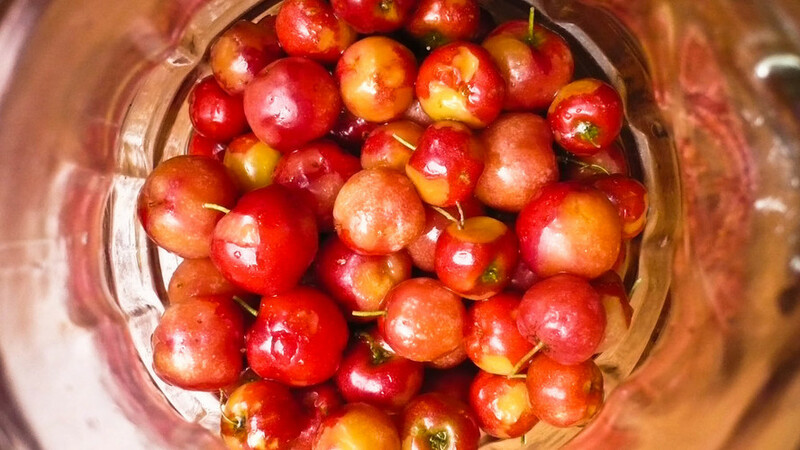 Remove the stems from the cherries, wash in cold water, and remove the pits. The cherries will dry faster if they are syrup blanched or at least checked in boiling water for thirty seconds, followed by a plunge in cool water. Optionally, chop the cherries in half. This will help them to dry faster. Line dehydrator trays with food-safe nylon or polypropylene mesh to facilitate easier clean-up. Place the cherries a single level thick, cut-side facing up in the trays. Dehydrate for 8-12 hours at 135° F in a counter-top dehydrator, or 24-36 hours in a convection oven. The dried cherries will be ready when they are wrinkled, dark, leathery, and slightly sticky. Store cherries in vacuum-sealed bags or sealed freezer bags in the refrigerator or freezer until you plan to use them.